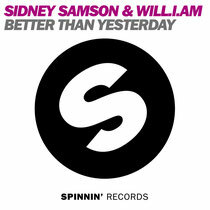 Fresh off the back of his recent stints in America and Australia, Dutch DJ/producer Sidney Samson returns on Spinnin’ Records with his new track ‘Better Than Yesterday’, featuring Black Eyed Peas main man, Will.I.Am. Having recently produced the Billboard Top 100 track ‘Get It Started’ for Pitbull and Shakira, Sidney is no stranger to the upper echelons of pop cuts, and his newest slice is no exception. Coming in all guns blazing, ‘Better Than Yesterday’ is as infectious as they come, laced with will.i.am’s signature vocals. This latest offering brings yet another asset to the table to solidify his position as one of the most prominent acts in the game, with release details still to be confirmed, have a listen to it below.